Wash chickpeas, and then place in a large bowl. Cover with water and allow to soak overnight. 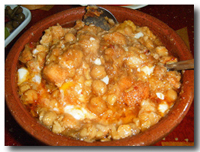 The following day, drain chickpeas and place in a large cooking pot. Cover with water. Add a pinch of baking soda and cook on medium heat until tender, about twenty minutes. Add the minced garlic, Harissa, cumin and salt; simmer for an additional ten minutes. Just before serving, add lemon juice, olive oil and breadcrumbs. *Lablabi image (C) Drmaik (2007). Used under the Creative Commons Attribution-Share Alike license.